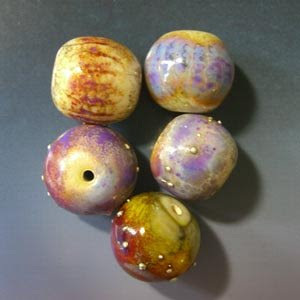 The very first glass bead workshop I ever took from a national level instructor was with Andrea Guarino-Slemmons, almost two (three?) years ago. She was a most gracious instructor for a novice in over her head. 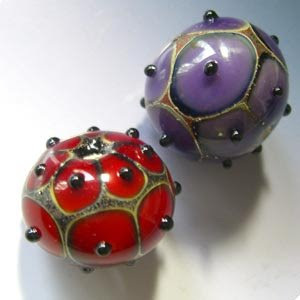 I just wanted to survive the two days without breaking a bead -- I'd never handled that much glass before!! By that measure, it was a successful class for me. I came home knowing that I needed to practice, practice, practice. This time around I thought I might be able to make a leap rather than just survive. 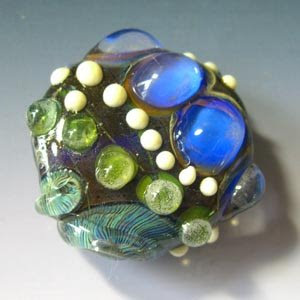 Andrea is one of my most admired glass artists, for the simple reason that she is an innovator. It was no surprise then, that there were many so many new techniques in the workshop. My salmon egg beads were better this time (not great still, mind you!). My galaxy bead last time actually turned out pretty well, and this one was OK also (those are simple, pre-Galaxy beads next to it, to learn how to silver fume). 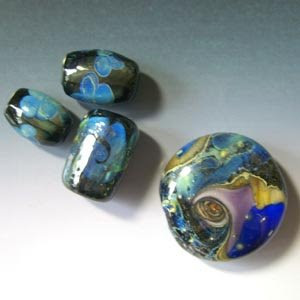 Last time, we made a Sea Garden bead, but this time we made the similar Nautilus bead. It involves gold fuming, which we could do now since Blue Moon Glassworks has a nice ventilation system in their new location. 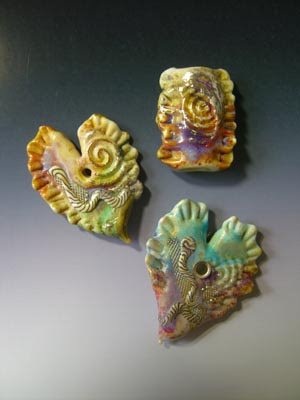 Andrea has been making Moth Wing and Ammonite beads for years, and we got to try out those. I couldn't work quite fast enough to keep from breaking up the silver fuming, but I was getting better. 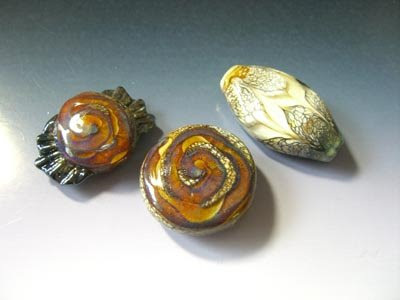 My favorite techniques involved enamels and freeform off-mandrel work. 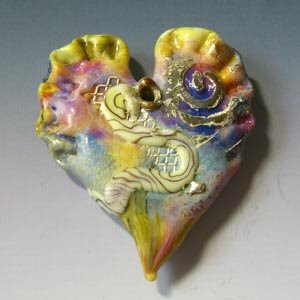 First we made simple beads to get the hang of the enamels, then we used those with silver mesh and foil to shape ruffled rectangles and hearts. It's hard to see the stripes on the top two beads, because I didn't get enough enamel on them, but I think I understand the concept. I managed to make this heart at home afterwards, so I think I've got this part down. I'm now trying to visualize my own freeform designs to try out. Great colors and the ruffles are well done says my inexperienced but "I know beauty when I see it" eye.